These delicious donuts are very dense and filling. I had two for breakfast on Sunday morning along with a glass of almond milk and was pleasantly satisfied for several hours. I suspect a donut of the unhealthy variety, with sugar and flour, would not have left me the same. No, my blood sugar would have spiked and then subsequently fallen, leaving me craving more. That's the beauty of living a low-carb lifestyle…cravings be gone! 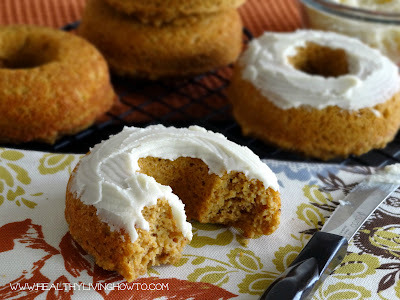 By the way, these pumpkin beauties are <2 g carbs per donut.